Remember when Tim Burton made great movies with a fantastic sense of dark comedy and heart? Well those days might be over (Exhibit A: Dark Shadows), but don’t fret. There are still plenty of the like out there. Norman can see things that no one else can. Like Sixth Sense stuff. Yup, Norman sees a lot of dead people in his already dark town of Blithe Hollow (known for a witch trail). But after a 100 year-old curse threatens the city Norman and his weight challenged friend Neil, must take on the goblins and ghouls to protect their town. Forget animated, or stop motion. ParaNorman was one of the best zombie movies I’ve ever seen: period. First off, technically, the film is a joy to watch and the animation is completely mesmerizing. Secondly the voice talent is superb with Kodi Smit-McPhee and Christopher Mintz-Plasse leading the way. But it’s more than a few laughs and get technically sound movie. The movie takes the familiar but old and distant Salem witch trials, and makes them human, heart-breaking even. Funny, smart, and sweet? Watch your back Burton. Posted in Review and tagged 2012, Anna Kendrick, Casey Affleck, Christopher Mintz-Plasse, Elaine Stritch, Jeff Garlin, Kodi Smit-McPhee, Leslie Mann, ParaNorman, Review, Tucker Albrizzi. Bookmark the permalink. Hobbits, wizards, dwarves, New Zealand….we’ve been here before, haven’t we? Peter Jackson decided that 3 Lord of the Rings films wasn’t enough and proceeded to decide that neither one or two movies would be able to adequately cover J.R.R. Tolkien’s The Hobbit. The result is An Unexpected Journey, the first in a trilogy taking place 60 years before the events of the LOTR trilogy. Nothing wrong can happen when doing three prequels to an already adored trilogy, right George Lucas? The Hobbit is the tale of 12 dwarves, 1 wizard, and 1 hobbit attempting to reclaim the homeland of those dwarves at the Lonely Mountain. The reason this isn’t easily done is due to a dragon named Smaug. A lengthy intro explains all of this, so don’t worry. Of course then we get shot into Fellowship of the Ring territory, with Ian Holm’s Bilbo Baggins and Frodo (Elijah Wood) only to get sent back to the time when Gandalf (Ian McKellen) asks the young Bilbo (Martin Freeman) to join in on an adventure. An hour or so of the movie passes by and we finally get on our way. Of course, the group led by Thorin (Richard Armitage), has plenty of hurdles to overcome, including rock giants, cave trolls, and those pesky Orcs. With the decision to make this a trilogy we only get the beginning of the journey, but there is plenty more to come. My chief concern going into the theater was that each scene would drag on forever. After all, this was originally going to be one movie. Combine that with the fact that An Unexpected Journey is 170 freaking minutes long, I would say that I was warranted in my concern. For the most part, it wasn’t too much of an issue. Yes, most scenes tend to run a tad too long, but the beautiful imagery is enough to keep you distracted. And what beautiful imagery it is. Rivendale most stood out to me, and we get several camera shots that we haven’t seen before. And Gollum! I could watch that creature forever. It is absolutely stunning how much they have improved him since the original trilogy. Absolutely mind boggling. My finally verdict however eventually comes down to this: haven’t we all seen this already? Yes, the story and most of the characters are new. But it just seems too familiar. Hopefully it can improve along the rest of the way. Posted in Review and tagged 2012, Adam Brown, Aidan Turner, An Unexpected Journey, Andy Serkis, Cate Blanchett, Christopher Lee, Dean O'Gorman, Elijah Wood, Graham McTavish, Hugo Weaving, Ian Holm, Ian McKellen, James Nesbitt, Jed Brophy, John Callen, Ken Stott, Lee Pace, Lord of the Rings, LOTR, Mark Hadlow, Martin Freeman, Peter Hambleton, Peter Jackson, Review, Richard Armitage, Stephen Hunter, Sylvester McCoy, The Hobbit, William Kircher. Bookmark the permalink. It’s the one that started it all. Who would have thought that this 1962 film based off a novel, would spawn a franchise that would run even to today, fifty years later. Ladies and gentlemen, may I introduce you to Mr. James Bond? For the first challenge, James is out to save the space program, and the entire world from the half German, half Chinese, metal hand-having, Dr. No. After a fellow agent goes missing in the Bahamas, 007 is sent to see what is going on. Beaches, babes, and booze are sure to follow. I really wish this was the first Bond movie I’ve seen. Unfortunately, it is not. And while I think it started the franchise on the right foot, it definitely is not the best. While the formula is not quite there yet, the villain is definitely top notch. Dr. No, may not be the most physically intimidating nemesis, but is mysterious, has a wicked deformity, and is a pretty cool baddie. And how cool is it, to reveal 007, with the famous, “Bond…James Bond”? All in all, a solid Bond, but not the top of the chain. Posted in Review and tagged 007, 1962, Bernard Lee, Classic Review, Dr. No, Ian Flemming, Jack Lord, James Bond, Joseph Wiseman, Lois Maxwell, Review, Sean Connery, Ursula Andress. Bookmark the permalink. Well, it’s all come down to this. 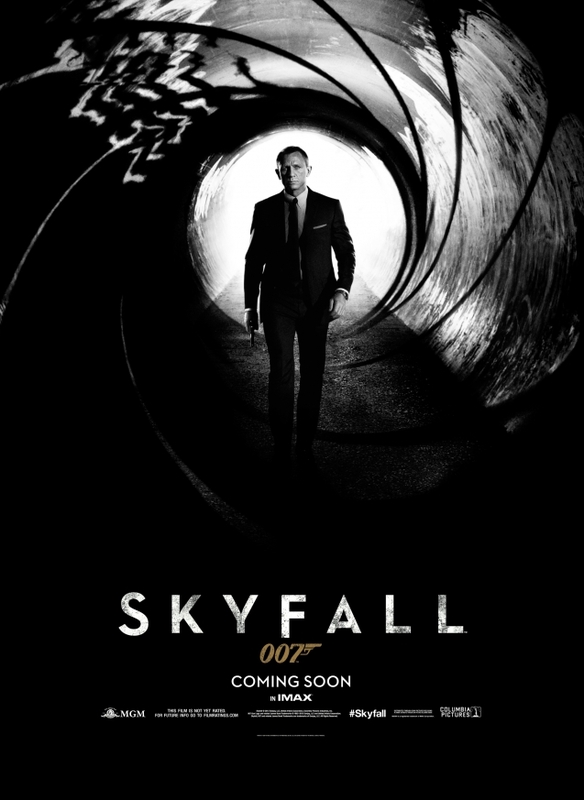 I’ve gone through 6 James Bond films in the past 2 days, to prep for Skyfall. Surprisingly, it isn’t Casino Royale or Quantum of Solace that fit best with Skyfall, but rather the classics during the Connery and Moore days. Fair warning: spoilers abound below. Skyfall starts out with the usual chase scene; what you’re used to in the Craig era. This chase soon leads to the alleged death of Bond, at the hands of a fellow agent. Begin typical Bond intro. Enter Bond with woman, enjoying his “death”. Of course, he does return, only to find M (Judi Dench) on the verge of being forced into retirement and a crazed mad man (Javier Bardem) hacking their system, blowing up MI6 HQ, and leaking the identities of undercover agents. All in a days work for 007, right? I was extremely nervous going into the theater. After all, I hadn’t heard anything but rave reviews about Skyfall in the entire week leading up to seeing it. It began, and the opening chase scene was on par with Casino Royale and Quantum of Solace. The title sequence was just as good. Craig was typically good, Dench top notch, per norm. It was all in all a good Craig/007 movie. Then comes Javier Bardem’s Silva. Much like Heath Ledger’s Joker brought The Dark Knight up a whole notch, Silva did the same for Skyfall. He’s ten times more intimidating than the previous Craig-era villains, is only after one thing (revenge), and has the usual Bond villain deformity. The man is scary. What’s scary is that he isn’t after dropping a nuclear bomb, or taking over the world, he only want to see M die. Another reason Skyfall was particularly mind-blowing for me was all of the throwbacks. We get 3(!) new regulars, some of which haven’t been seen in a decade or more. Q (Ben Whishaw) was my personal favorite. If you remember the old Desmond Llewelyn days, you remember that he and Bond always had an interesting relationship. He was always older than Bond, but never afraid to let him know what he thought of him. Now, with a younger Q, the dynamic changes, but the same relationship is there. Also, what about bringing back the DB5? Ejector seat and all? Overall, as you can tell by the length of this post, this is now my new favorite Bond film. While it does lag, and the last sequence of events seems a bit out of place, I respect Sam Mendes trying to take the series in a new direction while still honoring the past. An absolute treat to watch. Posted in Review and tagged 007, 2012, Albert Finney, Bérénice Marlohe, Ben Whishaw, Daniel Craig, James Bond, Javier Bardem, Judi Dench, Naomie Harris, Ralph Fiennes, Review, Rory Kinnear, Sam Mendes, Skyfall. Bookmark the permalink. Sean Connery came back after a one film hiatus to star in Diamonds Are Forever, the seventh official 007 film. Sometimes, even the greats don’t know when to hang them up. Bond is after the diamond smuggling business and Diamonds Are Forever. James is soon sent to Vegas to investigate Ernst Stavro Blofeld and his high stakes diamond business. Diamonds are rapidly disappearing, and no one seems to know why. Leave it to Bond to put the world back in order. So far, in my journey of Bond films, Diamonds Are Forever is by far my least favorite. Don’t get me wrong, it had its moments (the multiple Blofeld’s, the rappelling from the side of the hotel). But these bright spots were the minority, and a lot of corny lines, bad acting, and not great fight scenes were the majority. Luckily it gets better after the first hour or so. The first half we get 007 being chased in a moon rover. The second half is a pretty sweet oil rig battle. Also on the downside is James himself. I’ve been in love with Connery’s interpretation of the character so far, but this older, slightly chubbier version is not the same as Goldfinger Bond. He’s slower, less charming, and just second rate. I’d definitely like the film a lot better if they had the same vibe in the beginning as they did in the end. Unfortunately, Connery had to hang up the gun with a whimper instead of a bang. Posted in Review and tagged 007, 1971, Bernard Lee, Bruce Cabot, Bruce Glover, Charles Gray, Classic Review, Desmond Llewelyn, Diamonds Are Forever, James Bond, Jill St. John, Jimmy Dean, Lana Wood, Lois Maxwell, Sean Connery. Bookmark the permalink. Sean Connery has obviously hit his peak by 1965, as he had 3 previous films as the best secret agent around. 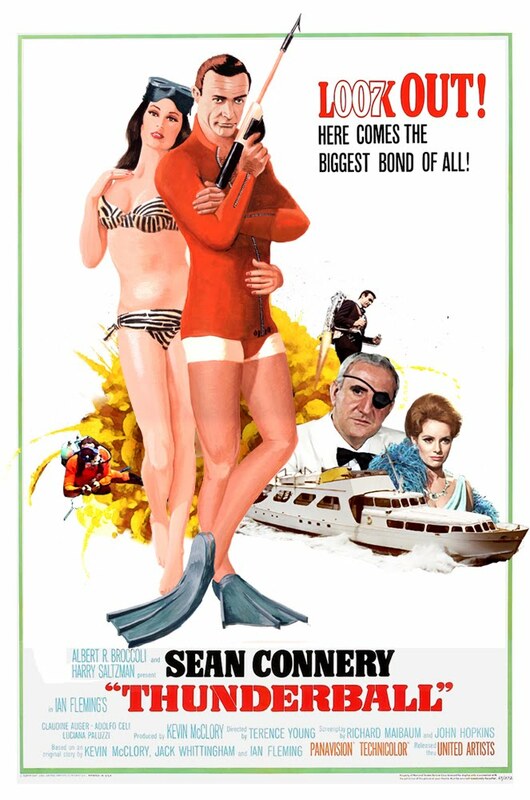 Thunderball changed things up however, changing the setting to under the high seas. Largely located in the Bahama’s, Thunderball finds Sean Connery battling SPECTRE agent Emilio Largo (Adolfo Celi). The main problem? Two nuclear bombs that seem to have disappeared. Of course, Largo and his collection of sharks, and underwater army are in the way of James figuring things out. I liked Thunderball. It is a consistently good 007 movie. No, it didn’t have the iconic scenes of the previously released Goldfinger, but it was good in its own right. I can’t really find much wrong with it in fact. It’s only downside is the movie that it follows. The film is capped off by a fantastic underwater battle between the good guys and the bad guys. Easily one of my favorite scenes so far in the franchise. Personally, I think old school Bond is personified in these tropical-set movies, and Thunderball is the best of that class. Very very solid 007 film. Posted in Review and tagged 007, 1965, Adolfo Celi, Bernard Lee, Classic Review, Claudine Auger, Desmond Llewelyn, James Bond, Lois Maxwell, Luciana Paluzzi, Review, Sean Connery, Thunderball. Bookmark the permalink. Again, like Lord of the Rings, Bourne, and Star Wars, I’m a bit behind on the man known as 007. 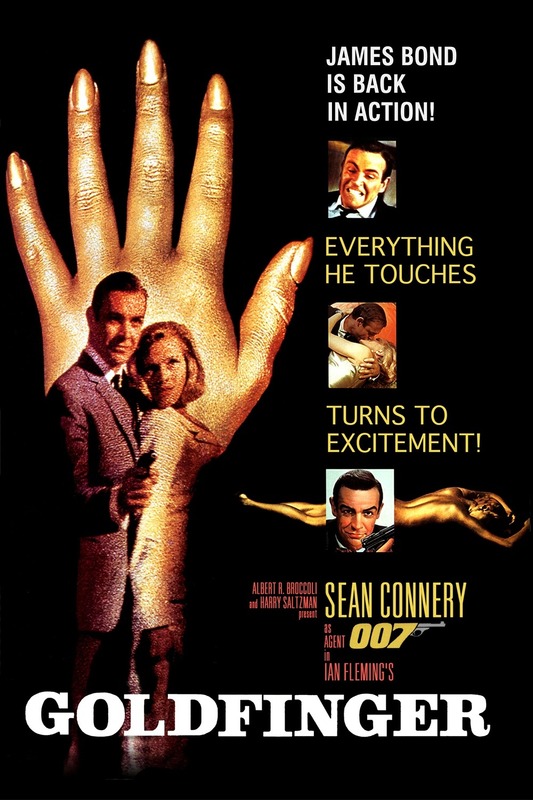 Unfortunately, I am unable to start from the beginning (Dr. No), but the third installment of the Bond series is often considered one of the bests, so why not Goldfinger? From Miami to Kentucky, Goldfinger is one of the more American Bonds. In this mission, Sean Connery’s James’ nemesis is Auric Goldfinger (Gert Fröbe) and his sidekick Odd Job (Harold Sakata). Bond is after Goldfinger, investigating into his shady gold investing. Soon enough, agent 007 is trying to stop a bomb going off in Fort Knox. Of course, there’s also plenty of women, chases, and explosions along the way. This is my first Bond film, so I’m not sure yet what characters and themes are reoccurring, but I do know that I like what I see so far. From the Aston Martin DB5 to the death by gold paint, Goldfinger is filled with iconic lines, imagery, and set pieces. The duo of villains is especially top notch. There are some technical problems, such as the sped up film, and bad dubbing, but that comes with a fifty year-old movie. The real treasure I’ve found is Connery. Clever, witty, debonaire, and atop it all, dangerous. Seriously, he wrecked a woman’s car just so he could get a chance with her! How much more dangerous can you get? With what I’ve seen, combined with what I’ve heard, this is one of the best Bond’s out of the bunch. 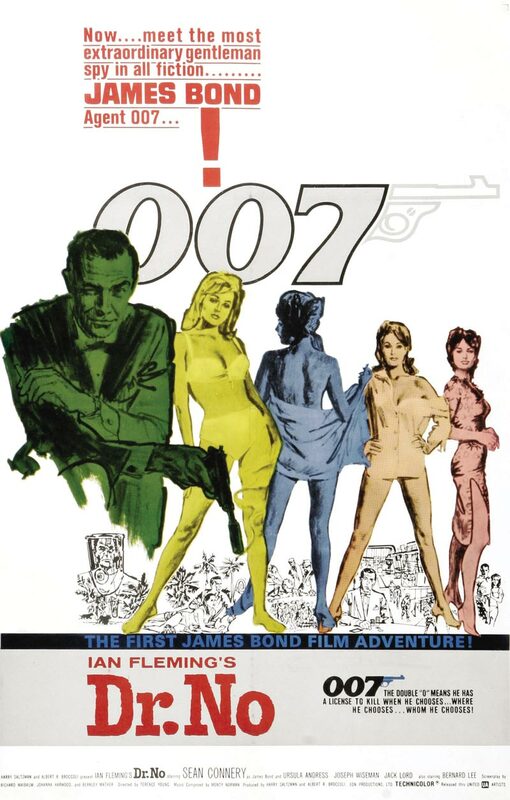 Posted in Review and tagged 007, 1964, Classic Review, Gert Fröbe, Goldfinger, Harold Sakata, Honor Blackman, James Bond, Review, Sean Connery. Bookmark the permalink.